With a smart design that keeps the cord out of the way as you iron and a retractable button feature, this T-Fal iron has a smooth glide and satisfactory steam performance. We were happy with how simple it was to fill the 9-ounce water tank through the sealed inlet valve while keeping the iron in the horizontal position. Light indicators tell you when the iron has reached the target temperature and remind you that the iron is plugged in. 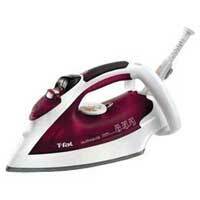 For $38.49, this T-Fal iron has a basic dial control and a hefty, sturdy design that will make ironing more efficient.